In 1602, the Dutch East India Company (Verenigde Oostindische Compagnie, better known as VOC) was founded and established a direct shipping route between Europe and Asia. It was through this route that large numbers of Chinese export ceramics entered the Dutch Republic, where they were much admired and sought after. Known as 'kraak’ (derived from the Dutch name for 'caracca’, a type of merchant ship) and almost always blue and white, this style of porcelain was originally created in China for the Portuguese and Spanish markets. Both Portugal and Spain had been trading in Asia since the early 16th century but their home markets had greater interest in spices – pepper, cloves, nutmeg – than ceramics. The porcelain imported by the Dutch was deeply coveted by wealthy European collectors with a taste for exotic goods. At the time, flaunting ownership of treasures from the East was seen as a sign of prosperity and affluence. In particular, the Dutch nobility acquired Chinese ceramics, often by way of gifts, and decorated their homes with them. Wealthy merchants and business people followed suit to such an extent that by the early 17th century a ‘porcelain mania’ was taking over the country. Invoices show that quantities as large as 100,000 to 250,000 pieces per ship were being transported to the Dutch Republic. 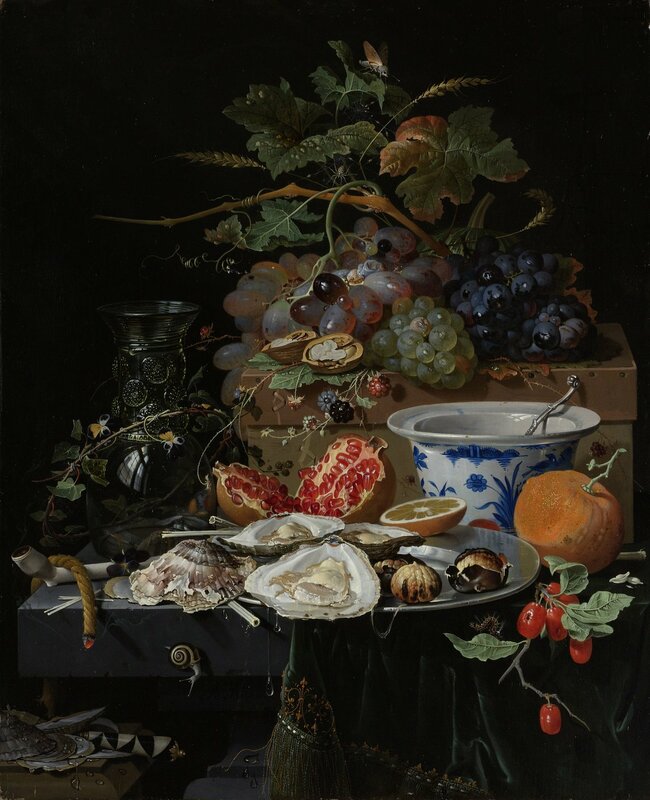 'Kraak’ ceramics often appear in Dutch still life paintings of the 17th century, where they feature alongside desirable goods including imported carpets, silver and crystal, and often hold partially peeled sumptuous fruits. 'Kraak’ wares were developed in China for export during the Wanli period (1573–1619) as a lighter-weight ceramic that could be efficiently transported and stored. 'Kraak’ typically consisted of white plates and bowls with underglaze blue decoration created using cobalt imported from Persia (Iran). The objects were usually graphically divided into a series of radiating panels with floral designs and a central medallion design of flowers, birds, animals or an idealised landscape. Some followed the Chinese illustrative tradition, whilst others were made with Western motifs and coats of arms after designs provided by the Dutch. In keeping with market demand, potters in Japan and even Persia imitated 'kraak’ and, with the fall of the Ming dynasty in the mid 17th century, Dutch orders for ceramics started to go to Japan instead of China. Although Japan was essentially closed to international contact at that time, concession was made for the Dutch who enjoyed a monopoly on Japanese wares and continued to trade from the island of Dejima near Nagasaki. 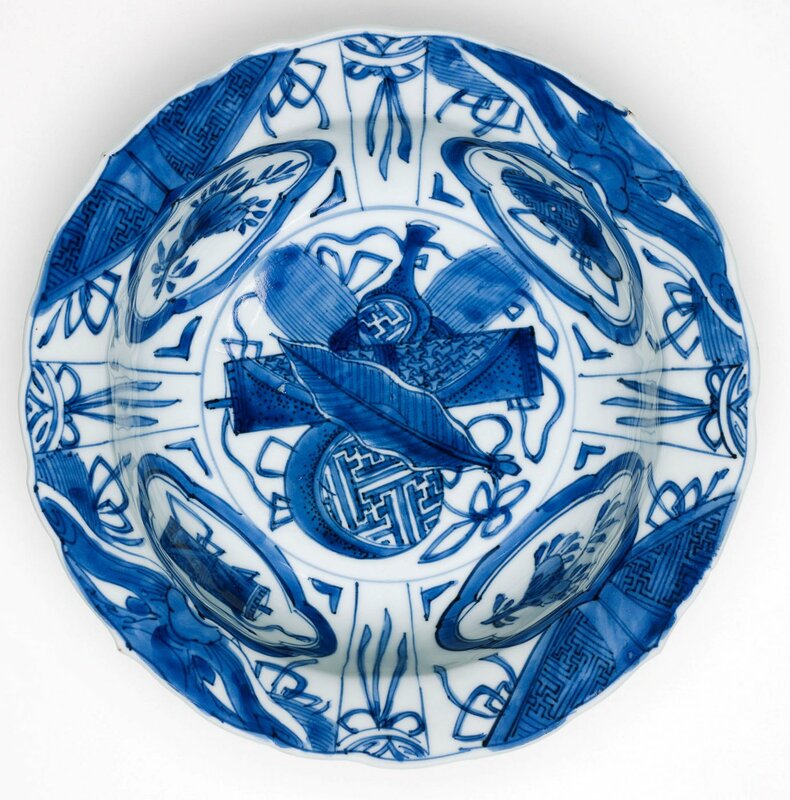 The craze for 'kraak’ and other Chinese and Japanese porcelain changed by the 18th century, when European factories developed the technology to create genuine porcelain. Natalie Seiz is curator of Asian art at the Gallery. Recent exhibitions she has curated include: 'Yoshitoshi: One hundred aspects of the moon’, and co-curator of 'Beyond words: calligraphic traditions of Asia’.